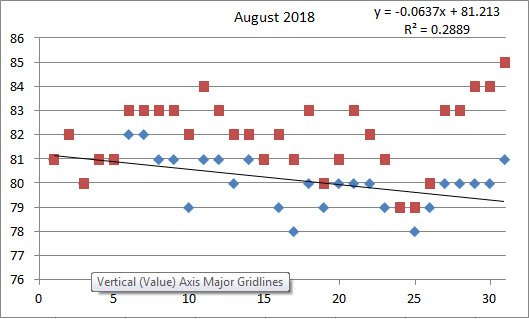 August’s water temps similar to July’s last 2-weeks staying around 80°/81° with 20 days being 80° or 81°. Surf had a narrow range and a low of 78°, high of 82°. Sound had a low of 79° and high of 85° and an average of 82.0°. 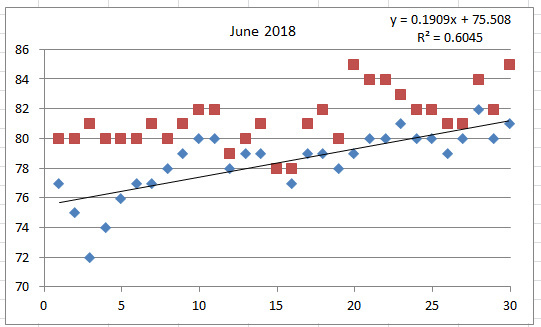 Averages for surf and sound almost identical, surf was 80.2, sound 82.0, Check out the graph, blue diamonds are the surf, red squares are the sound temperatures. We had our initial mullet blow on 8/26 with the surf at 79°, anchovies made their initial run on 8/24. Old reds: Radio interview by Dr. Bogus with Capt. Joe Shute on 8/13/18, Ben Ball Host of Coastal Daybreak, WTKF 1240 AM, 107.1 FM. Dr. Bogus: This is a season for the old drum fishery, before we talk about the old drum catching…you’ve been, not to harp on it but you’ve been around here for quite a while Capt. Joe. Capt. Joe Shute: Yes I have! Dr. Bogus: You’ve seen a lot of changes. Capt. Joe Shute: I guess I’m kind of equated with the old drum; I’ve been down here running charters since 1987, so I was probably one of the first of a handful of people with a skiff that fished inside in the early days. Dr. Bogus: What I wanted to get to before we get to catching those guys, in 1997 we had the Fisheries Reform Act and we also went into the situation where we started to protect the resources, the red drum resource which we were getting to the point of killing them all off. So how had that gone, compared with those days when things were really at a low, how do things look now? Not only with the slot drum but also the old drum because, it’s been long enough now that some of those fish are getting older. Capt. Joe Shute: Right, the old drum fishery is as good as I ever seen it. 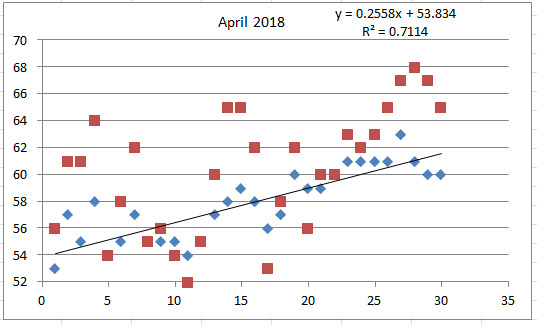 Both up in the Pamlico sound, you’re seeing good concentrations of them and especially in the winter months now around Cape Lookout from the shipping channel at Beaufort all the way to the east side of the cape, we do real well on then there from about November through January and February and some up into April even. Dr. Bogus: They’re working those menhaden schools out there. Capt. Joe Shute: Right, you’re catching them anywhere from 15- to 20-feet of water out to 50- to 60-feet of water. You’re hearing of larger numbers of old drum coming from the New River area, you’re hearing them down near Wilmington a lot more than they ever have been in the past that I have seen or heard of and the old drum stocks are really looking real good right now. Dr. Bogus: Interesting you mentioned the New River, because, one of the things that I have noticed over the past few years it that the piers on Topsail Island are catching a lot of those big old drum. And I don’t remember hearing that in years past. Capt. Joe Shute: I didn’t either, not in the quantities that they are catching now. They’re having some days, pretty heavy days down there now. Dr. Bogus: I assume they are spawning up in the New River and just working in and out of the New River Inlet. Capt. Joe Shute: Right, I would imagine that a lot of that is coming from there either that or they are just filtering down from the Pamlico. Dr. Bogus: Joe, the old drum fishing is kind of a specialized fishery, what sort of tackle do you recommend, if you are using bait or even artificials these days. Capt. Joe Shute: A lot of people in the last little while started fishing for the old drum using popping corks, which is something fairly new for the old drum in the last few years and it’s been right effective. They are using some of the DOA 4- to 5-inch Air Head Shad, they’re running them about 24-inches below the popping cork and they are working the edges and points around there especially where there are schools of bait fish. It’s been real surprising it’s been real effective on those old drum getting them up off the bottom and getting them to come up and take a bite. Of course you need some heavy tackle. When I say heavy, a good heavy, medium to heavy action spinning rod preferably with 20-pound braid or 30-pound braid on your main running line and something that you can get these fish back to the boat fairly quickly, but that’s been coming along real good. There’s also a big fly fishery up there for them now. Basically the same rig is used; it’s called a Pop-n-Fly that Gary Dubiel came up with. It’s a popping cork basically with a fly suspended 18 to 20-inches underneath the popping cork. And the same thing in 20-feet of water you’ll get these big drum to come up around those bait pods and eat that bait 20-inches under the water. Dr. Bogus: Twenty years ago you didn’t see people fly fishing for these fish, did they? Capt. Joe Shute: Noooooooo! And we do a lot of that in the fall. We target them and do real well with fly gear around the Cape in November and December. And conventional fishing I use a lot of heavy spinning gear, 30-pound class and above spinning gear. I use 50 and 60-pound braid on my reels because I really want to get the fish back. Your basic rig is the Owen Lupton rig, which is just a very short…the whole rig is only 4 or 5-inches long, it’s got a fixed 3-ounce egg sinker and a 10/0 circle hook on the bottom of it. And you fish just with your drag tightened down if you’re fishing it with bait. The fish picks it up, goes to move off with it, the egg sinker pulls the hook to the corner of the mouth and probably 90-percent of your fish are hooked in the corner of the mouth and are real easy to release. And the circle hook is the way to go. Capt. Joe Shute: Yes, a barbless circle hook. All these fish are above the slot and have to be released. And the reason for the heavy gear and the heavy drag is you want to get these fish back to the boat and released with minimal detriment to the fish because the water temperatures in the sound, especially in August and September are so hot if you play these fish on light tackle you’ll end up killing them. They can’t handle the heat and I use a huge net to land my fish and most of the fish…the party wants to take a picture so we’ll pull the fish out real quick and get a picture. After we get a picture of a big fish, most of the fish I never even bring into the boat. I’ll leave them in the net take the circle hook out, let the fish go, and the fish is no worse for the wear. A lot of people get up there and want to take a picture of the fish…they don’t pay attention to what’s going on, they’ll hold a 40-pound fish up, the fish will wiggle and fall and hit its head on the boat. You know that’s not too good! Plus a lot of the males and females both when you pick the male up he’ll secrete sperm all over you, and it’s as slippery as it could be and the same thing with the females with the eggs. So the least you can handle these fish the better off you are. Dr. Bogus: This fishery has gotten quite popular over the years; do you think we’re impacting those fish? Obviously the growth of the fishery is partly because there are a lot of them around. Capt. Joe Shute: Right, I think that more and more education to people as far as how to handle the fish, what tackle to fish with, you don’t use “J” hooks anymore, you just use circle hooks on them. I think that that’s had a big impact. Dr. Bogus: We’ve got a lot more user friendly with them over the years. Even though the fishery has expanded we’ve gotten better at handling them? Capt. Joe Shute: Right and there’s been a lot of education put out there from the DMF and also from guides that do seminars and tell people. The main thing is pushing the barb down on these circle hooks because many people don’t realize, and I used to get this all the time on the fisheries commission about how need to switch everything over to circle hooks, because it’s a catch and release fishery. What people don’t recognize is the circle hook was not designed as a catch and release hook; it’s a catch and HOLD hook. If you don’t push that barb down and you don’t know how to properly release a fish with a circle hook, you end up doing more damage than you do good. Capt. Joe Shute: There are barbless manufacturers but it doesn’t take but a second with a pair of pliers to pinch it down. So it (the hook) will just slip right back out. The main thing is to take it out the same way it went in. You can’t just push it straight down like you can with a “J” hook and pop it out because it’s got the curve in the hook; you actually have to rotate that hook around to get it out. Ben Ball: How old are the old drum? Capt. Joe Shute: They can be anywhere, when they are hitting the upper 30’s, 40’s and 50-inch range they can be anywhere from five or six years old to 50 or 60-years old. They live a long time and some of those fish that you are catching that occasionally we used to see a lot of them years ago, even though there weren’t as many you would see the 60 and 70-pound drum, and they are still out there. And there are a lot of them. I would say the majority of the drum people are catching now are anywhere from 35 and 50-pounds and once they get up to a certain length you can just about within a few pounds get the weight of the fish due to the length of the fish. If you got a 45-inch fish he’s pushing 40 to 45-pounds. Dr. Bogus: The state record is that 94-pounder (1984), and that was estimated to be over 50 years old. We’ve talked about flies and DOA soft plastics on a popping cork but the traditional method was using live or cut bait. Capt. Joe Shute: Mostly it’s cut bait; the two most prevalent baits are menhaden and mullet. A lot of the guides really like to use mullet; they feel that the mullet will get them a better bite. This time of year especially don’t go out there with just a dozen mullets and expect to fish for a while, the pinfish and skates and rays are very bad. Most of the guides when they go out there to fish a full day they take 50-pounds of mullet with them. And they will go through on a good day, 50-pounds of mullet. I leave Morehead and run up there through the ditch and I always stop here and load my boat up with fresh menhaden. I keep some alive and I keep some on ice and I constantly change baits and we’re fishing six to 8-inch baits and I’m using half a fish on each hook. Capt. Joe Shute: That’s the way it works, I fish six rods when I go, but I know people that fish as many as 12 rods, and that’s too much work for me. Because when you get out there, sometimes when it’s real frustrating you’ll cast your six rods out and about the time you get to the sixth one you’ve got to do it all over again, because there’s nothing, no bait left. The bluefish and the pinfish are that bad. But you know a lot of times that will create a (chum) slick and that will get the drum in there also. Ben Ball: They you can try your popping corks and flies. Capt. Joe Shute: That’s right, that’s right. Dr. Bogus: It’s amazing with the popping corks, well I guess sometimes those fish could be suspended part ways up off of the bottom, but often they can be right on the bottom feeding that dinner bell gets them all the ways to the top! Capt. Joe Shute: It gets their attention and they will come up and check it out. A lot of them you know are cruising around the schools of bait and, they won’t be on the bottom but a lot of them will be underneath the bait on the bottom picking up what falls to the bottom. So it’s a very good way to get their attention and when they come up and see that little shad floating there they say okay I’m going to eat that. Ben Ball: You use popping corks in the creeks. Dr. Bogus: Oh yah, in the wintertime particularly like to use various kinds of corks because I can adjust the speed that I work them and there in the wintertime the fish get a little sluggish and so we want to be able to do that. Joe you said you use 50-pound braid on a 30-class reel. Capt. Joe Shute: Right, I use one of the old 7000-Penn Battle reels and I actually have 65-pound braid on mine. And I use a 30-pound class spinning rod and you can put a lot of heat on those fish. And when I’m setting my drags for the fish I’m setting it at 12 or 15-pounds. It takes a lot to pull them off, but the good thing about that is when that lines starts going that hook’s already set, you never have to set the hook. It’s great for charters because people say, “well when do I set the hook?” I say don’t worry. “When will I know if I got a bite?” I say don’t worry, whenever the rod bends over and you hear the line start squealing then touch it and pull it out of the rod holder. 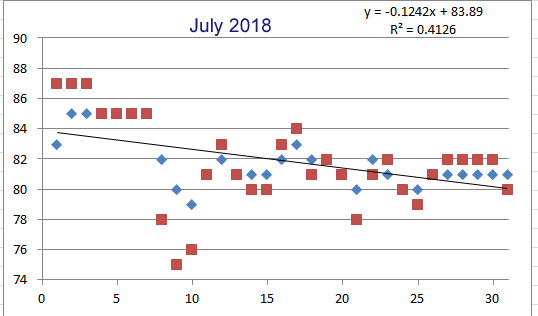 July’s water temps started off unusually HOT (85°) then dropped, normalized and stayed around 81 for the rest of the month. Surf had a low of 79, high of 85, sound a low of 75 and high of 87. Averages for surf and sound almost identical, surf was 81.9, sound 81.8, Check out the graph. 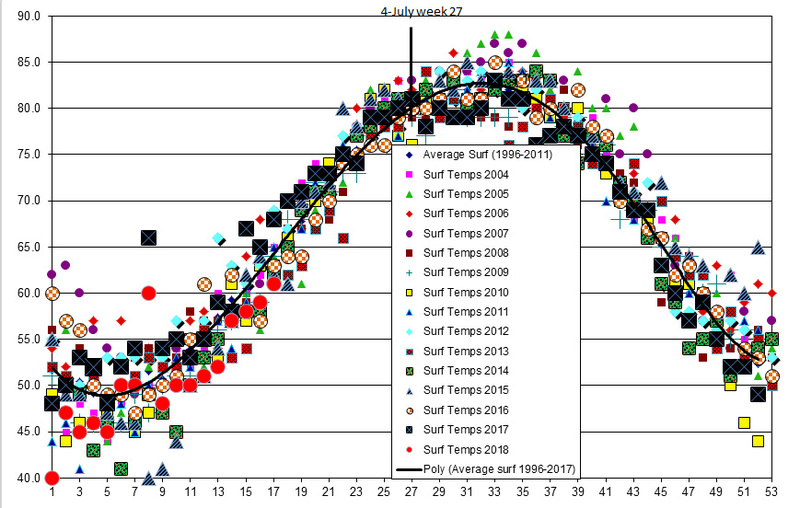 Check out the graph, blue diamonds are the surf, red squares are the sound temperatures. We also had extreme super tides in July and excessive amounts of rain and rainy days. Posted July 16, 2018 by Doc & filed under Articles. Radio show from 06/18/18, Ben Ball Host, WTKF 107.1 FM, 1240 AM. Dr. Bogus: I have a guest, Jim Hutchinson, who is the managing editor of The Fisherman Magazine. I subscribe to TFM when I lived on Long Island back in the 1970s. I have actually written bunch of articles for it. I like the magazine and subscribe to it still even though a lot of the info is north of us, but there is enough articles in there…we’ve interviewed a lot of your writers Jim! Jim Hutchinson: I’m sure you have, we used to have the mid-Atlantic edition, Eric Burnley and Chris Dollar great guys ran that magazine and we all miss it, I get e-mails and phone calls all the time people asking to have that old mid-Atlantic edition again that covers the Delmarva Peninsula to North Carolina. Dr. Bogus: I finally got to you because you wrote an article recently and it caught my attention on the history of soft plastic baits. I’m sure s lot of people out there don’t remember the first time they used a soft plastic bait…boy I sure do! Do you Jim? Jim Hutchinson: I do, but it’s funny, because you started that “Graduate” intro and throughout writing this article and the research I kept laughing about that line too. I do and I alluded to that in the article the whole concept of the crossover. I grew up at the Jersey Shore but found my way into this freshwater lake at a country club. Some friends and I figured a way to sneak in to the back and that was when I saw a largemouth bass for the first time and we were catching pickerel and sunnies and stuff, but when we saw the largemouth bass it was like looking at the eddies in the distance. It prompted us to go out and try to find something to throw at this fish to catch it. And it was a plastic frog that worked for the first time, and for the life of me I cannot remember what that frog was called. But that was not only my first foray as a kid into mail-order catalogue shipments for mail-order items it was also my first opportunity to catch a largemouth and it led to that crossover with using these plastics that we found on that lake then figuring out that gee these work on saltwater as well. Dr. Bogus: Well I remember specifically for me it’s when I lived on Long Island I was a hungry post-doc and so I was trying to gather all the protein I can on a post-doc’s salary. And I remember fishing the Shinnecock Canal. It’s a tidally operated lock canal that connects the Atlantic Ocean with Peconic Bay, and every spring, right around Mother’s Day the weakfish/ gray trout would come through that canal and locks to Peconic Bay to spawn. And being a tidally operated lock system, when the tide was going the wrong way it would close up. And so we would fish that area just on the ocean side and the first bait I used was one of Jim Bagley’s Salty Dogs, which was a plastic tail of a shrimp that you put on a lead jig head. I remember one day, one Mother’s Day by the way, that I brought home 40-pounds of weakfish. Ben Ball: I was very late to this game, mine was on a Thanksgiving Day actually fishing for a gray trout in the Haystacks using a lead-head with a plastic worm on it. Dr. Bogus: One of the things you mentioned Jim was the idea of the crossover bait, you know there are so many baits that were designed…you know like Rat-L-Traps, spinner baits etc. that were really freshwater, not only freshwater but really bass baits that have really taken hold as far as saltwater fishing as well. Jim Hutchinson: It’s funny you mention trout whether gray trout or weakfish, whatever, The jelly worm the Mann’s Jelly Worm which was developed on a stove-top for largemouth bass. But talking about what you put on a jig head. 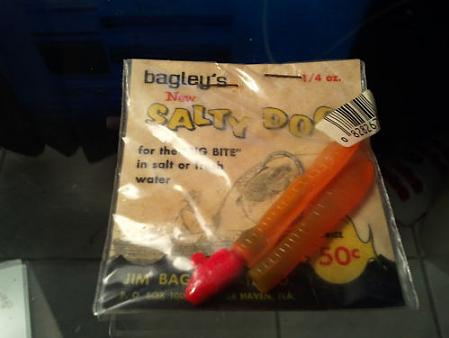 I think that that was the second time I was introduced to plastics in saltwater fishing, was a neighbor of ours when I was a kid had introduced me to a Mann’s Jelly Worm on a bucktail on the jetty rocks for weakfish. I every once and awhile I see a saltwater crossover, a lure or tactic into freshwater, but for the most part it seems that things cross from freshwater over to saltwater. Dr. Bogus: Yes including the flies as well, that’s absolutely true. And it’s funny that we both discovered that sort of thing targeting weakfish! Let’s go back to some of the…I remember mine from the 1970s, you from about the same era, but really the first ones were a bit before that. Can you give us a bit of the early history of the first soft plastics Jim? Jim Hutchinson: That was what was fun about doing this article, and I kind of couch it by saying there is a lot…if you go back to some of the manufacturers, they tell you a little about their history and I got a lot from Capt. Jim White, a book of his (How to fish Soft plastics in Saltwater). But really what I had done was to go through, and we started putting together some of the earliest remembrances, the Creme Lure Company for example. Creme has created a couple of lures, the Creme Scoundrels and a lot of these and a lot of these I hadn’t really heard of. So we’re going back into the 1930s and 1940s, and it’s funny to think that if you use The Graduate as a frame of reference from the 1960s, to think that there are already plastic lures and soft plastics in place before that, that’s kind of funny. One of the shocking ones, and Dr. Bogus and I had shared some e-mails about it, was a popular Storm bait that had come out early 2000s, it was a Storm plastic paddle tail swimmer and a lot of the guys had picked up on that for striped bass and it was for the most part very, very unique, nobody has ever seen anything like that and it was produced by the folks at Storm. But before that there was a bait by Panther Martin and Panther Martin, lot of folks know them from their little spinners, the little spinners with the blades for fresh water. But they had developed a molded plastic swim bait much earlier than that, they went back 30 years or something like that. That was pretty interesting. Dr. Bogus: We think that the flavored baits we have are really the top of the line, but they had flavored baits well before us, right Jim? Even jelly flavored worms! Jim Hutchinson: My understanding, I talked with Scott Wall from the Mann’s Bait Company to figure where that “Jelly Worm” name came from. It was from the jelly. It was Tom Mann back in the 1960s tinkering around with the bait he started putting in flavors and colors he put in some jelly preserves to see what would happen and lo and behold a lightbulb went off in his head…”I’m going to go with this.” And here it is all these years later… I called a couple of folks about the Mann’s Jelly Worm earlier this winter, when I was doing this story and lo and behold people still carry them in saltwater shops because they are still the “go to” when fishing for gray trout on a bucktail. Ben Ball: I’ve caught cat fish on an old peanut butter and jelly sandwich before. Dr. Bogus: There have been other flavors that people have used, I remember people, they may still do it, I’ve seen people sprinkle garlic powder on their baits, or use licorice. You’re laughing but it’s true! Ben Ball: You’ve threatened using gummy bears. Dr. Bogus: I sold them in my store! Jim Hutchinson: I’ve seen photos, the magazine gets photos from families…dad uses some Gulp! the kid says wow that stuff looks like this and they will put out a Gummy Worm. I’ve had photos where the fluke was caught on a Gummy Bear. Dr. Bogus: One of the things that some of those early baits, either soft plastics or even the rubber ones, the tubes, they didn’t have a lot of action. So back in the 1970s finally we has some baits with personality, little curly-tail action. How did that come about? Jim Hutchinson: Necessity is the mother of invention! You started taking these plastics and these worms just never had much action, YOU imparted the action and so the work looked like a worm, so you jigged it up and down or just gave it a little wiggle but eventually they started getting into the whole curly-tail. And again, it’s one of those things that’s kind of neat to look at because those curly-tail shad, those paddle tail shads, when they first came out in the 1970s, they were great for fresh water and the manufacturers would gear it to the freshwater market. But when you start bringing it across to saltwater, people find they start working. It was sometime in the 1990s when a friend of mine had given me my first molded shad and that was something that had been used over in the freshwater market. Then the guys started dragging these big umbrella rigs for striped bass up in north Jersey and the New York Bight and you would attach these rubber shads to the umbrella rigs. Well we just started free-weighting them around jetties and they had such a realistic swim. But you know it was around that time in the 1970s to come up with something to make the bait to look like it’s swimming that really launched everything. Dr. Bogus as you know if anyone is talking about flounder fishing, what’s the one thing…make sure you have that paddle tail Gulp!, that swimming mullet. Think about how the technology has caught up with scents not just the scents but the whole chemical research into the way a fish strikes. Ben Ball: Metal plastic, sometimes wood is Doc’s mantra. Dr. Bogus: Jim, we were talking about some of the materials, I’m a chemist so I was always interested in the development going from polyvinyl chloride (PVC), to polyvinyl alcohol (PVOH-Gulp! baits), to silicones. That development has been interesting to watch especially from the environmental aspects as well. Jim Hutchinson: Freshwater anglers and lakes seem to be under assault from the earliest as far as trying to keep those lakes free of anything that is not biodegradable. And you look back at those big baits that have that curly-tail action they thought of using some of those chemicals like PVC and materials that don’t biodegrade. So it has been something that been, really in the last decade that started with the folks at Berkley with Gulp!, and to the best of my knowledge it’s not fully biodegradable, it biodegrades after a long time. Ben Ball: And you want to keep your plastic baits separate you’ll end up with a gooey mess! Jim Hutchinson: You learn that lesson ONE time where you try to keep your plastics all separated, and when you don’t that’s a fun way to start your spring after a long winter. Dr. Bogus: Yah, you have to scrape things out with a spatula! Jim Hutchinson: That’s something I see that we will continue to go through in the next few years in terms of development, is folks trying to develop these lures that are fully biodegradable and still have that incredible action. Dr. Bogus: One of the baits you mentioned earlier Jim were the Storm baits and that was an interesting development as well by not just having something you put on a jig head but the embedded weights and embedded rattles too. Jim Hutchinson: Absolutely and that’s the thing, when Storm came out in the early 2000s, they really took the striper world by storm. But I mentioned that there would be the Vivif by Panther Martin that predated that. It doesn’t really matter who came first, but when people found that molded plastic it was like “Oh my God this is great.” The first problem we had was when bluefish and other toothy critters…hahahah! Dr. Bogus: You know how that goes! The effect of barometric pressure on fish. David Ross, PhD (Woods Hole Oceanographic Institute, WHOI), Effect of barometric pressure on fish. Radio show from 04/09/18, Ben Ball Host, WTKF 107.1 FM, 1240 AM. Dr. Bogus: I have from time to time talked about what I call my library club, my book club, and one of my favorite books on the shelf is called the Fisherman’s Ocean, subtitled How Marine Science can help you find and catch more fish. That sounds like something I’d be interested in…right? So we have David Ross who is Emeritus Professor at Woods Hole Oceanographic Institute, Good Morning David. David Ross: Good morning how are you? We’re doing great this morning, what’s the weather like on Cape Cod? It’s still pretty cool out here, but the snow is gone, and it’s starting to warm up so I’m getting optimistic. Hearing your fishing report kind of gets me even more itchy. Could be worse, could be better. Dr. Bogus: This has been a trying winter and spring and one of the reasons why your book has been one that I have used a lot and is on my bookshelf, we’re both scientists and I’ve always had the thought, and this is what I do on the radio show, “know thy fish…catch more fish” is my approach to fishing coming from the background that we have both come from. What is your background Dave? David Ross: I’m actually an oceanographer and most of my research has been in the Middle East, but I took some early retirement that’s why I’m emeritus, still working at the institution. And decided to use my marine science knowledge and combine it with my fishing interest, I’m a fisherman, I catch fish, I eat fish, I catch them on fly rods, on catch them on spin I catch them trolling. So I started writing a bunch of articles about science and fishing. I started writing for a magazine called Saltwater Fly Fishing. I wrote about 60 articles and it turns out at that time I was the only guy doing that, and there really isn’t that much science on fishing, on the kind of fishing you and I like to do. Then I combined it into this book, which is in its eight printing, to my amazement. I still write things and more recently I wrote an article, which I think caught your attention about barometric pressure is it important for fishing or not. So I still give talks and fish a lot, I live on the water. I have a boat that came from Morehead City; I have a Jones Brother’s boat that I use. I fact I visited MHC in 1965 coming up on a cruise, a research cruise and ended up judging the Miss Bluefin Marlin Festival…which itself is a story which we don’t have enough time probably to cover, but it was kind of an amazing experience. Ben Ball: It’s the Big Rock Blue Marlin Tournament now! David Ross: If they need another judge just let me know. Dr. Bogus: We have David Ross from WHOI on Cape Cod; we’re talking about environmental factors that influence fish. We’re going to get to barometric pressure momentarily, but what are some of the other environmental factors that when the fish are who they are? Of course one of my favorites is water temperature, decided who and when but are some of the other ones that really decide that? David Ross: Up here on the Cape, water temperature certainly is important, but probably tides and tidal currents are the most important thing up here. Fish are opportunistic as you know and magnificent creatures, I’m a big fan fish. I think they are wonderfully evolved, that have things that they can do much better than humans. Their sense of smell for example is about 1,000 times better than the dog and the dog is about 1,000 times better than a human so fish can smell about a million times better than us. But tide is very important, temperature is important, presence of bait, time of day can actually be important, turbulence as it may affect oxygen content in the water. I see fish as being very opportunistic creatures and if there is food, of if there is the right structure which can trap or trap bait, they are going to take advantage of it. Fish have been around for about 450 million years or so, we have found fish that old, and they have evolved to the environment superbly. The only problem is that they haven’t learned anything about electronic devices or nets, so in that respect it’s our advantage. On the Cape, we get pretty much have similar fish that you do but not all the same, stripers, bluefish, false albacore, bonito, offshore tuna. Bottom fish like tautogs, black sea bass…by the way, climate change is affecting us up here. Dr. Bogus: How are you noticing that? David Ross: Well several ways, we see fish species coming a little bit earlier, we see black sea bass is a wonderful example of this. Black sea bass really wasn’t an important fishery until a few years ago, it was more of a middle-Atlantic fishery, now because of the warmer temperatures the black sea bass have moved up here and it’s a big cash fishery up here last couple of years and beautiful fish and a lot of them. We see lobsters who like cool water moving farther north, so their range is changing. A lot of fish of course can tolerate a decent range of temperatures, but there are temperatures that they prefer. But the sea bass and their presence is certainly a good example of how changing temperatures is affected the fisheries here. David Ross: A hundred questions, first of all fish cannot predict the future. Humans cannot predict the future, so let’s not give fish too much credit, they can’t do that. When we talk about barometric pressure we’re talking about the marine environment, and I’m not talking about fish that live in the top one or two feet of water. Let me make a strong statement, barometric pressure has NO effect on marine fish, no effect. And let me explain why. The barometric pressure is the result of the 160 miles or so of atmosphere bearing down on the land and ocean, and we call that one-atmosphere right about sea level. But because water weighs so much more, and is so much denser than the atmosphere, you only have to go down 32.8 feet in the ocean to have another atmosphere of pressure. In other words, 32.8-feet of water equals the entire pressure of the atmosphere. So what if for example a fish is swimming along nicely and a 3-foot wave not a big wave, comes along every 3 or 4 or 6-seconds, that change in pressure that that fish is experiencing is equivalent to the change in pressure for a hurricane like Katrina, which took 2-days. So in the space of 6-seconds our fish is experiencing a change in pressure equal to Katrina…every 6-seconds. Suppose the fish goes ups and downs, to take a lure goes up 3-feet same thing! A tide goes 3-feet, same thing. Basically it’s like this, you and I are talking, but as we’re talking, there’s also some lady talking in Miami, do you hear her? David Ross: That’s the point. Now barometric pressure when it changes and it changes very slowly, brings other things, changes in cloud cover, maybe wind direction, maybe changes in temperature, maybe changes in turbulence…what have you. Now those things might influence fishing. And coming back to fish and their bladders, fish can tolerate an awful lot of things, like human beings. When you swim in the water you can dive down quite a bit, fish are even better at this, so a change in barometric pressure and neat as it sounds, is really some change in the weather pattern that’s happening and some fishermen think that this is great and they’re going to catch more fish. And I’m of the opinion that is you really think you are going to catch fish, and you go out there and you are intense about it you are usually going to do better than if you go out and just be casual about it. Ben Ball: That’s Dr. Bogus’ feeling too! David Ross: You try harder, you change your lures if nothing is working, you move around, you’re more enthusiastic and usually you do better. But barometric pressure I’m sorry to say, the physics just aren’t there, just doesn’t make a bloody difference to the fish. Dr. Bogus: I‘ve been trying to convince people that for years and you always get a lot of blow-back on that because people have their experiences that they say…“look well see this, I did great that day”. David Ross: Ask them what color underwear they had, that may have just as much an effect. Dr. Bogus: David, one of the things you mentioned in your article that I read, is a term I use a lot, “east is least and west is best,” why don’t you tell us why. David Ross: Well, I wish I completely knew. I my case it’s the wind direction and where it comes from and I think that’s always important when you’re fishing and you have a tide or moving current, where the water comes from. And if the water comes from the east it’s really not going to have much bait in it and it’s not going to be as attractive as water that is coming from the west. We also have a lot of protective areas, a lee area so a west breeze, the water coming from the west is preferable. But fish got to be somewhere, they are not going away, so you can still catch fish when the wind is bad, you just got to know where to go and you got to do it a little differently. Like I say, fish are great creatures, they don’t stop eating because the wind isn’t blowing in the right direction and if they see something that’s good to eat they’re going to take it. You just have to be there and take advantage of different conditions. But you’re right, and we have another expression up here, “it’s no use if it’s not chartreuse”. David Ross: And that to me is an amazing one, because as an oceanographer I can tell you that there is nothing, nothing natural in the ocean that’s chartreuse, nothing! Ben Ball: I know, isn’t that interesting. David Ross: There’s a reason, chartreuse is a color that is seen further away than most other colors, so it’s visible, so that’s why if everything else is equal, somebody has chartreuse it’s more visible for a fish than most other colors. Dr. Bogus: Most fish are sight feeders so that really makes a big difference. David Ross: Well, I might not 100% in agreement with that, they are sight feeders at the last moment. David Ross: But often they are attracted by noise, and by smell. I remember some experiences fishing on some of our flats area where nothing was biting at all and a friend of mine pulled out the ugliest fly you’d ever seen, but it had a rattle in it, he threw it out and boy you can see the fish just change direction the first time that rattle and go attack that ugly, ugly fly. So different things, different times and whatever. Ben Ball: You said your book is in its eighth printing. David Ross: Yah, much to my amazement. If I may, I make pennies on the book, but I love to recommend the book, and I’ve written a lot of books on oceanography, so this is not my source of income. The book has in my opinion a really good section on tides and tides are one of the most complex things in the ocean, it’s really a complex phenomenon. So I think if you read this the average fisherman may might have a better feeling or understanding for tides and that in itself might be worth the price of the book. Ben Ball: And here with our tides, again similar to you only we have a south facing beach. Dr. Bogus: We have a south facing beach we have Bogue Sound and we have the ocean and a barrier island. David Ross: I understand, I would be complicated. In fact if I was down fishing down there, which I haven’t done for a long time, I think the first thing I would do is get in touch with a charted guy or go to a fishing store just trying to learn about the tides. Ben Ball: I imagine you get that question about barometric pressure all the time, just like Dr. Bogus does. But it’s the ancillary things that are happening around it. Dr. Bogus: They are associated with a lot of changes that the fish can key in on. Check out The Fisherman’s Ocean, How marine science can help you find and catch more fish. By David A Ross, PhD. Posted May 2, 2018 by Doc & filed under Articles, Fishing. Another chilly month for water temperatures! Surf at Bogue Pier ranged from a low of 53° to a not very high of 63° with an average of 57.8° (blue diamonds) nearly 7° above March. Bogue Sound had a low of 53° and a high of 68° with an average of 60.3° (red squares), about 10° higher than March. Temps did increase during the month but still ended up below normal. The below plot shows the temperatures since 1996, the black curve is the average data over that time. 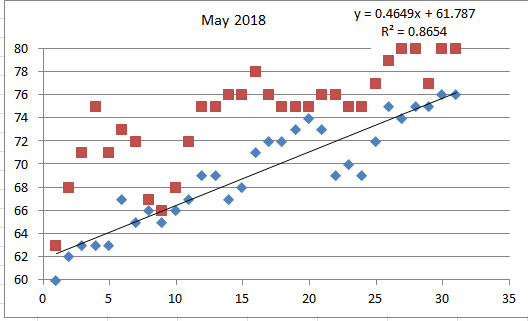 The BIG red circles are 2018 temperatures, almost all below the average curve. Place bluefish fillets on a lightly buttered aluminum sheet on your broiler pan. Prepare a thick paste of mayonnaise, horseradish lemon juice and Worcestershire sauce and spread it over each fillet. Garnish each fillet with slices of onion, sprinkle some freshly ground pepper and salt over the fillets. Bake at 400-degrees until the paste is has a bubbly brown crust, the onions start to brown and the fish is moist and flaky. Place bluefish fillets on a lightly oiled sheet of aluminum foil on a broiler pan. In a food processor, chop onion, and jalapeno and tomato along with the cilantro, coriander salt, into a salsa. Add the lime juice and stir. For better taste, the salsa can be made ahead and allowed to marinate prior to use. Spoon the fresh salsa onto the fillets with a slotted spoon to minimize excess liquid. Cook at 375°, just until the bluefish flakes apart, not to dryness please!